It's been a good long while since the last Series 1 and 2 Upper Deck product has been released as there was no Series 2 last season. Well, the wait is over and here it is! UD1 is BACK, and it's coming in strong with the much touted double rookie class. 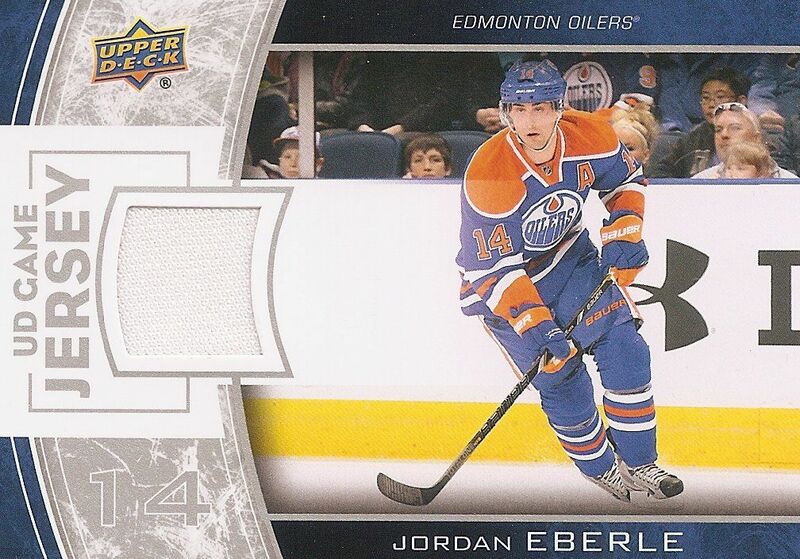 Upper Deck Series 1 is probably the most universally collected hockey card product out there. I'm sure collectors are excited to break into their boxes of it s it releases today. Let's take a look at what my box gives me! As you know already, there are no shortage of amazing photographs in Upper Deck Series 1. The base set of Upper Deck cares is a fantastic set to collect year after year if you want a yearbook of great NHL memories and moments. I would buy UD1 simply for their photograph selection. It's just that good. That being said, I am not as big of a fan of the graphical design elements this year. Upper Deck had been moving towards more minimalist, yet gracefully modern designs these past few years. These base cards are a bit heavy handed to me - especially the huge spans of foil along the bottom portion of the card. I would have preferred less foil in a more subtle design scheme. The card backs are of the usual Upper Deck Series 1 design type. The backs are clean, yet feature touches of silver ink and full color photography. There is enough room on the back for a long career statistical display. I appreciate the fact that Upper Deck has included not only the playing numbers for the player, but also have a little bit information about them in written form. The Young Guns this year, for me, are not good looking cards. I saw them in the previews and didn't like them, but I thought I'd wait to see them released before giving my final judgement. And it hasn't changed. Like the base card design, I feel that the Young Guns look a bit dated. The cool modern-ness of the Young Guns isn't there. The foil is just too much in one place all-together, and the stars and the actual Young Guns logo are just too cheeky as well. I've heard other collectors say they like the design quite a bit... well... agree to disagree on this one then! 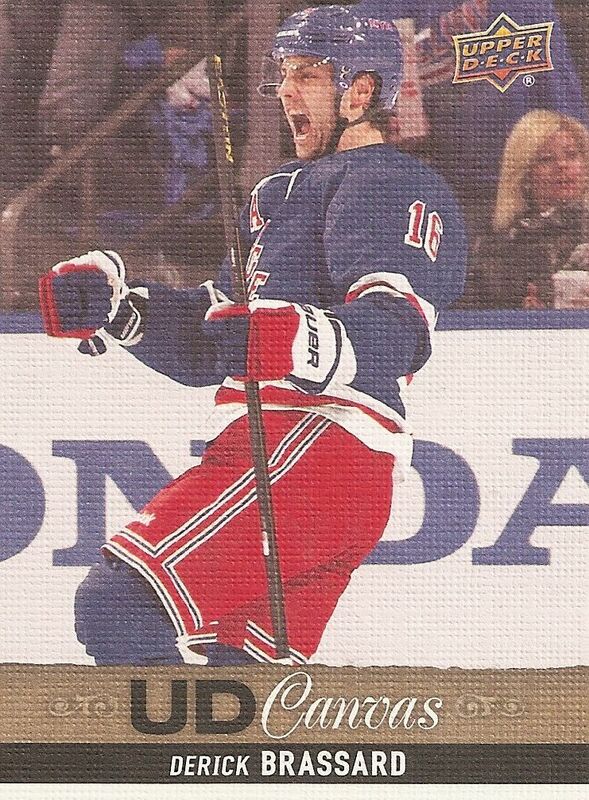 The back of the Young Gun cards are very cool though. 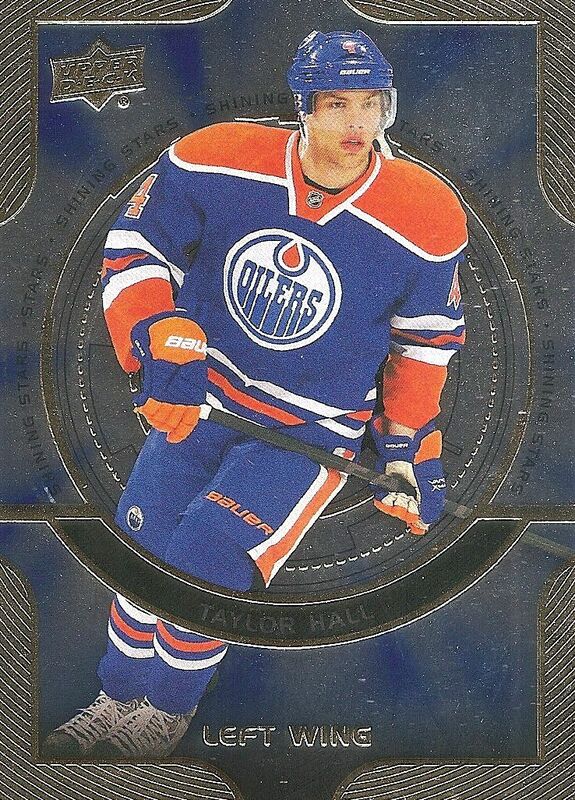 The backs feature a bright orange and red motif that is a very unusual color choice for hockey cards. The Upper Deck box configuration is tried and true, and familiar to hockey fans. Collectors can expect six Young Guns rookie cards and two jersey hits. Insert cards and parallel cards should be plentiful. Lucky collectors can pull autographs as well! One of the longest running insert sets from Upper Deck are the Hockey Heroes cards. This series is all about the 1980's. 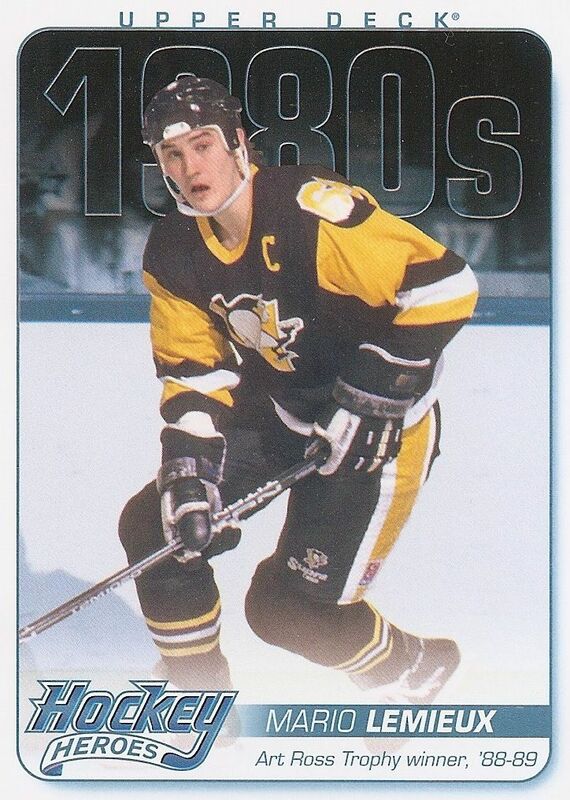 The 80's had some great names like Mario Lemieux shown above. 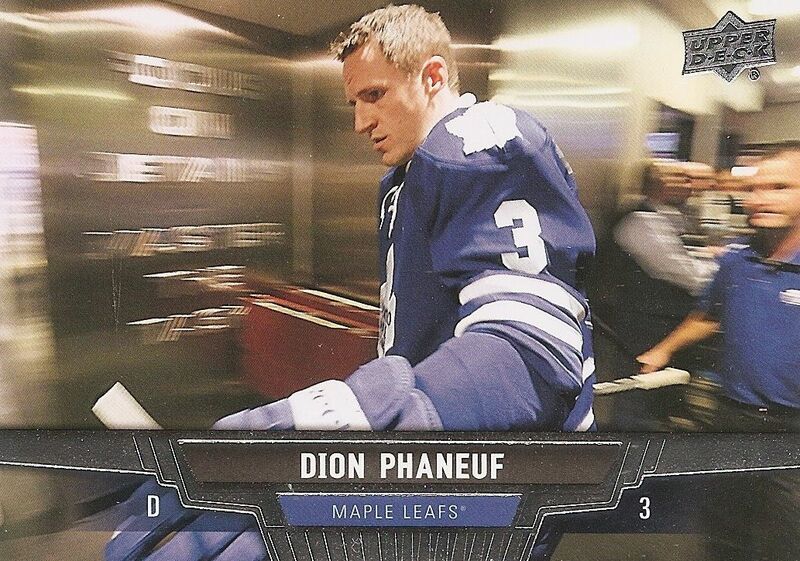 Though I'm pretty tired of the Hockey Heroes cards, the white with ice-blue borders looks very good to me. 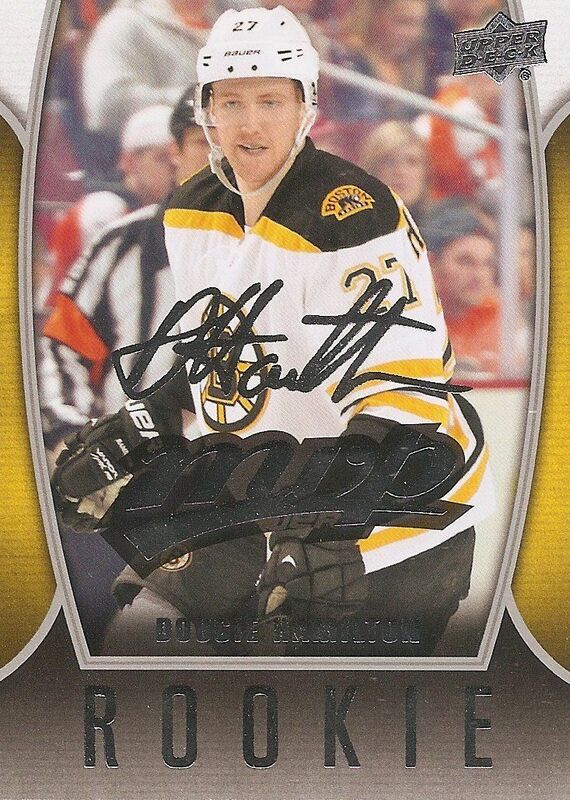 I got two Hockey Heroes cards in my box (the other was Ray Bourque). The Header card and Paint card are very difficult pulls with a stated odd of 1:600 each. The Header and Paint cards sell for some nice coin on the secondary market. New this year are these Shining Stars inserts. It's definitely a different looking insert compared to the others in the set as it is all foiled-out. Not only does it have the standard backing foil, but these cards have etched foil corners too. The corners are Artifacts-esque. The foil cards look nice, but I can't see my self getting too excited about them. Parallel versions of these cards exist, but good luck snagging one as the toughest parallel comes in at 1:1440! Canvas cards make their return for yet another go-around. The Canvas set is a great addition to the base set as they contain even more unique photographs. I did, however, feel that this years Canvas card felt a little 'cheaper' than those of years past. The cards in my box looked a bit faded to me. I'm not sure if that was by design or not... but the colors just don't pop out as much as I would like them to. 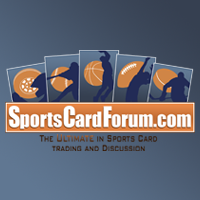 Collectors can find both standard Canvas cards as well as Young Gun Canvas cards. The Upper Deck Game Jersey cards have returned and look great this year. The cards are very vibrant and inviting. I was surprised to pull a couple of bigger names from my box - both Jordan Eberle and Dominik Hasek came out! Usually you get a couple of lower level players out of these boxes. From what I've seen, there are some pretty big names to find jerseys of this year. MVP is back as well in Upper Deck Series 1. This discontinued product continues to live on as an insert set. Getting these MVP base cards isn't exciting for me. Are there really huge MVP fans out there that want to continue collecting that set? I would rather Upper Deck come out with a new insert set to put in... or bring back the All World Team cards! MVP Rookie cards come about one per box. The design on these closely resembles the MVP base insert. There was a design a couple of years ago that I thought was fabulous for the MVP rookie. I wish Upper Deck did the same where the MVP rookie cards were dramatically different. The excitement just isn't there with these. My box of Upper Deck Series 1 was very standard. I didn't pull an autograph or acetate card. There are plenty of fun and rare cards to still find in UD1. I didn't get them, so it's up to you! Can you ever really go wrong with Upper Deck Series 1? The answer is no. 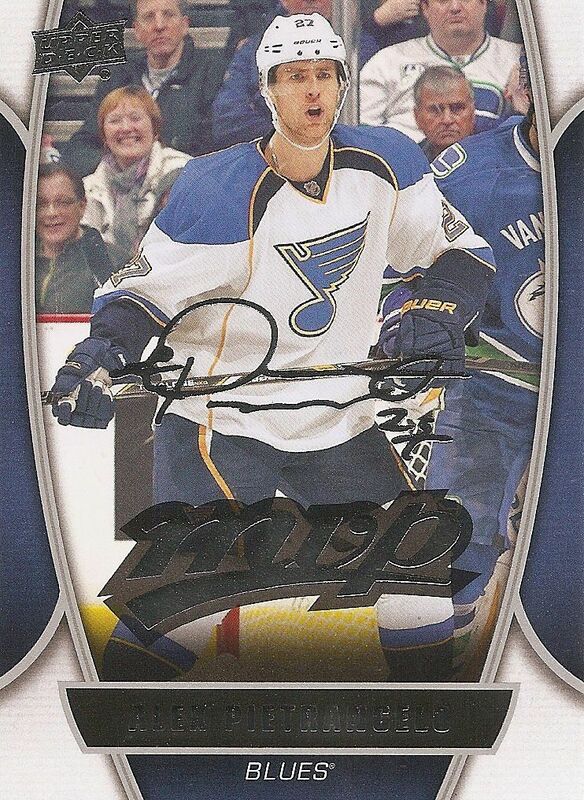 Upper Deck Series 1 again gives hockey fans a great product with desirable rookie cards. There are a lot of super Young Guns to chase down in this set. The price of UD1 is always accessible to all collectors, so it isn't difficult to get some for yourself. 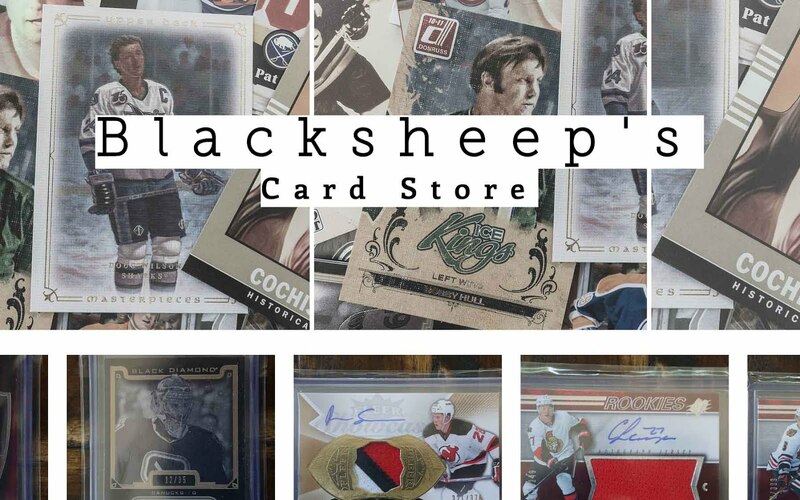 It is a product that every hockey collector should be buying! Though this is a again a wonderful hockey product, I personally didn't like the design aspects of these cards as much as I have in the past. I felt that the design of the cards took a step back from the great strides UD has made in coming up with super sleek and modern cards. Still though, the pictures more than make up for it! Upper Deck Series One is out... just go and get it already! These are looking a little cooler than last years cards, still with beautiful photography. Can't wait to see what more cards look like in your box opening video. Nice break! I might go pick up a box for myself. I'm liking these and the new panini select don't know which one is better of buying if you had a choice of one or the other which one would you chose? 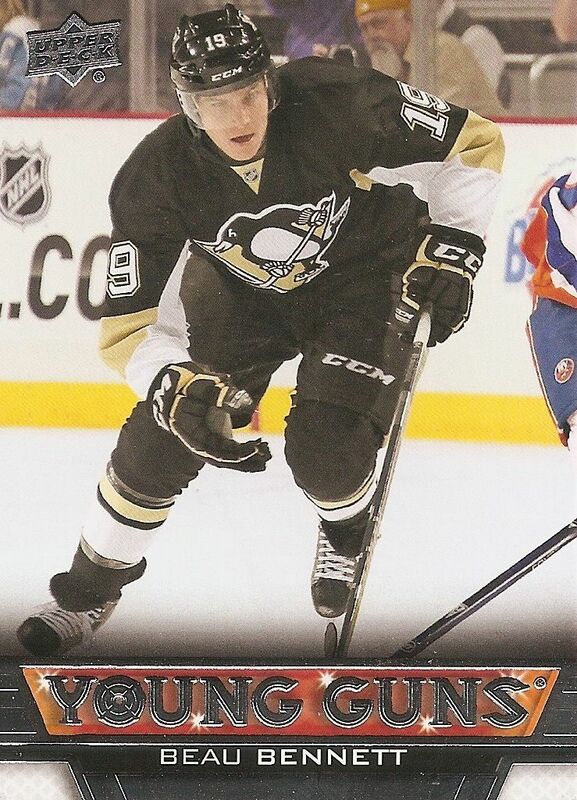 But liking the young gun cards. i won't be able to get select until later on this week... but my inkling is that select might be more fun in terms of hits. Like the set. The base photography is always amazing in UD Hockey. Agreeda about the MVP cards UD made MVP basketball in 08/09 and it had a terrible design. I agree with the YG's. They just look a little off and there's too much foil. However, the photography, as always, is top notch. These cards are on my Christmas list! The double rookie class is really the big drawing card here. Excellent review! Loving the double rookie crop ! Series 1 looks like great value with so many great rookies ! So stacked line up this year ! It was fun opening this years Series 1. I'm starting to get antsy about goin out and getting more packs already! I dunno why I like Series one more than Artifacts or any other card product. Such sweet cards! Love the product, it looks cool. Nice young guns! that nichuskin is this years draft I think he was pretty high up too! cool young guns all around Especially the etem and hamilton, I dont really like the design of the UD game jersey this year, I think it looks too much like the earlier 2000s jerseys. I thought you where supposed to get a ud canvas young gun in every box? . I agree with you about not liking the young guns. they lost a bit of their foil and seem to look more like the cheaper rookies, they do look a little better than the previews though. I think they should have made the orange behind the name the color of the players team instead. Its been a while since I've commented on anything, took a step back from the card game for a bit. Series 1 always tends to bring me back though. Even though it has a lower price point the Young Guns are my favorite product to chase. I like the look of the cards this year, base and the Young Gun Design. I dont find they did very much to change from last year. Again I love the canvas subset however the look this year isnt my favorite. The double rookie crop really adds to the value for me this year, as withing each box you at least get someone you know!! Thanks again for the video and contest and keep them coming. Really like the fact both rookie crops are incorporated into one product, really worth your money and really good Youngguns. I like the new young guns look this year! Series One is one of my favourite hockey products just because of how classic it is. Every year I find they improve on the classic set. Your box definitely had some nice young guns and jerseys. I think Series 1 this year is great, lots of inserts, I really like the MVP rookies and the double rookie class this year is just awesome. Young guns are great as well. I really like this set because it is always fun to open a bunch of packs with great photography. You know what to get out of Series 1, and in one way that's great of course! But this time, I think some of the more important design elements have taken a step back. The base card foil doesn't really work to me, for example, and the same thing about the Young Guns. Another minus is that UD included all of the hotter rookies in Series 1. Why couldn't they have saved the rookies from the actual 13-14 season to Series 2. Now we get both Yakupov, MacKinnon and all the other good names in this product, and that will left out almost anyone remarkable to Series 2. That affects both the value and feeling. This years series 1 for me is a hit and a miss. Every year I order myself a full case and hope for the best. - MVP Rookie Inserts - I enjoy that they are hard to get and the fact that they are autographed. 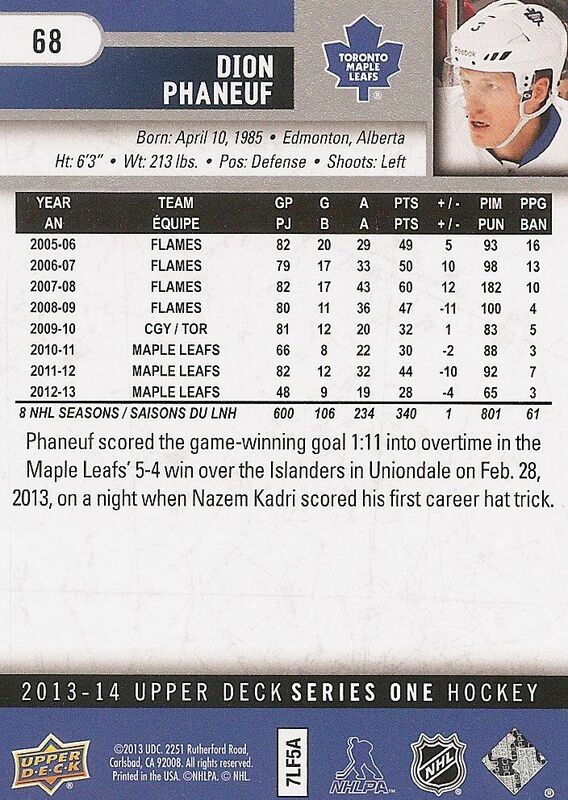 This is one typed of card that Upper Deck did improve the design on. - Canvas - I love the new design of them but I am not sure why it feels retro but modern. - 1980's I love the fact they are still going with this.. what I wonder is will they do 2000's next year and stop after series one? - Shining stars - I like the concept they were going with for the cards to have shining stars for each position.. Blaster Boxes get you Defenceman. Tins get you Goalies , Hobby Boxes get your forwards. But the design of the cards if horrible.. it looks cheap, last year silver skates was nice, simple and clean, this idk reminds me of cards from 96-97 where they had a protective peel off on the front of them. I don't remember the brand but I am sure you all know. My last and biggest disappointment is they ruined series 2 again this year. They should have spread the rookies out. 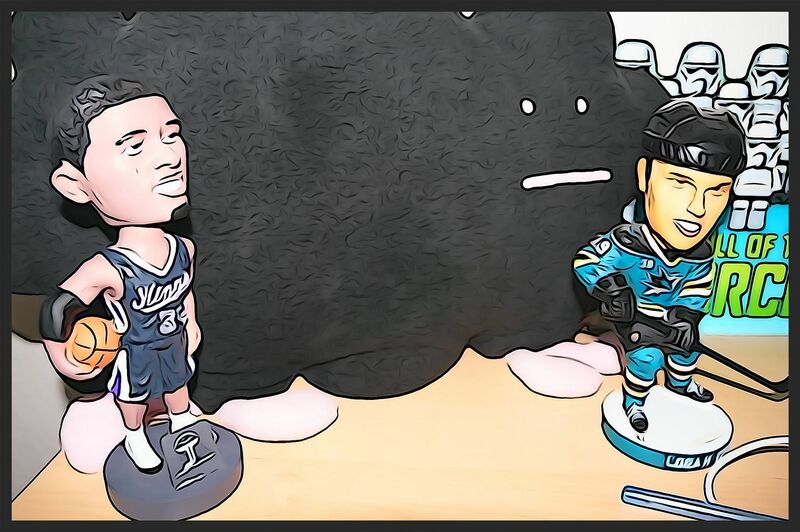 Left Yakupov and Gally for series 1 and put Hertl etc in series 2 or even some of this years rookies that are high calibre.. now like usual only the series collectors like myself will buy series 2 will the buy and sells wont. Overall 8/10 this year for me. Well you said that they shouldnt put MVP cards! I disagree there because they are awesome for your kids! They love that they can see players autograph and theyre great looking! I always have loved YG and panini will never made them as good as UD! UD YG are true legends on the market! Pictures are great looking as always! u said they shouldnt put mvp cards i agree . instead they should put in like one of the big draft picks of this yr yg instead of mvp or 1 dual auto or dual jersey but u pulled a great mvp rookie of hamilton but i think they shouldnt have mvp . and the bases pictures have inproved very much and look great but over the years the patches are getting smaller . I can totally relate to the great review you did. The base cards kinda do look the same from last year but your review makes me want to buy some of these. The Young Guns don't have the white edges like last year. Great review Luke! I feel that the young gun designs really fall below standard in my opinion. With a great rookie class, it brings the spark into wanting to collect the set. Love series 1 probably going to be my favorite of All the 13 14 products! I be going for the Young Guns set like I did last year can't wait to get a box!